This speaker owns excellent sound quality,with perfect audio design. Bluetooth audio transmission and handsfree call. pls charge over 2 hours before use,the red light will be lit when it is charging. FASHIONABLE DESIGN: Watch shape makes your sports carefree, running with music and do not need to worry about dropping. HANDS-FREE CALLS AND SELF-TIMER: Wear this watch when driving, and easily enjoy the hand-free calls. In addition, this could be used as a self-timer, use remote control to take a photo. 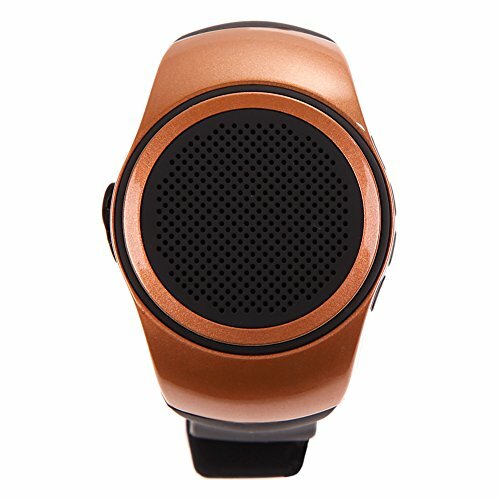 MUSIC PLAYER AND RADIO: You could listen to the music in your phone with this watch, or you could put a micro SD card into it, and get rid of cell phone.